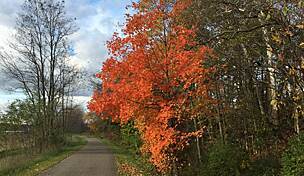 The Mohican Valley Trail runs for nearly 5 miles along a former right-of-way of the old Penn Central Railroad on the eastern edge of Knox County, between Brinkhaven and Danville. 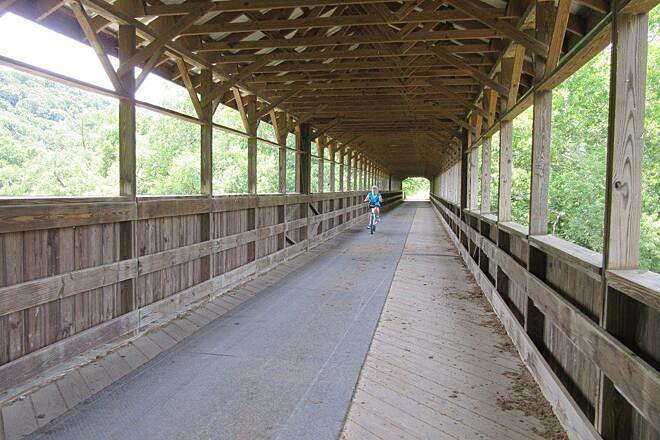 The trail features the stunning Bridge Of Dreams in Brinkhaven, a 370-foot covered bridge over the Mohican River. 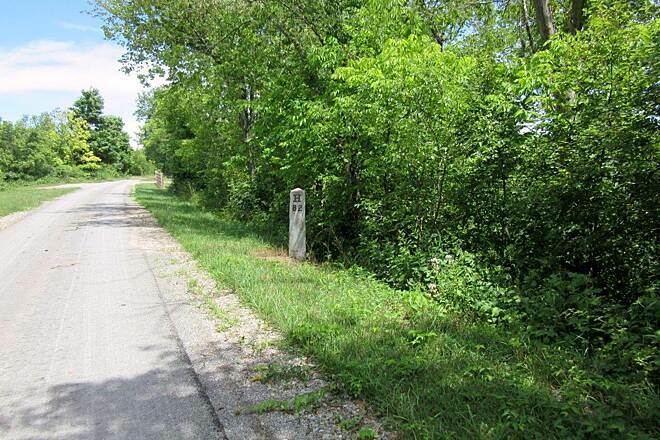 In Danville, you can carry on west along the Kokosing Gap Trail (no horses) or east on the Holmes County Trail. 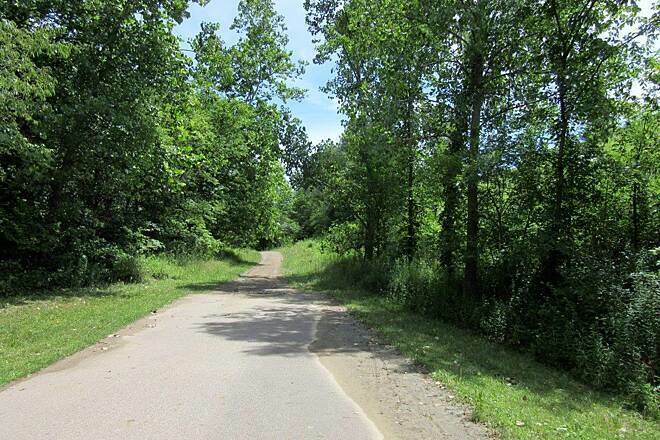 All three trails are also components of the Ohio to Erie Trail. The planned 320-mile route, of which over 240 miles are complete and open for use, will eventually span Ohio from the shores of Lake Erie in Cleveland to the Ohio River in Cincinnati. There is paving underway to extend this trail several miles further east from the eastern endpoint. 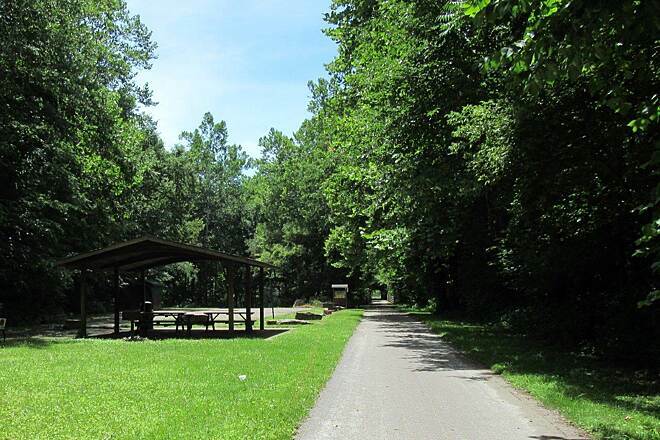 For horse trailers, park near the Bridge of Dreams (16606 Hunter Road) near where Township Hwy 218 and Main Street intersect (east of the river); at Tiger Valley Arch (15700 Tiger Valley Road) or at 402 East Street in Danville. Two additional areas are available off Buckeye Rd. near Millersburg Rd. I rode this trail today and wow, it's beautiful. The trail is incredibly well maintained, but there was almost no one on it. It had few road crossings and I couldn't hear cars in any direction -- very remote, very peaceful, very relaxing! Green in every direction. Road the Mohigan and Koskosing trails yesterday. The Bridge of Dream is in a class of its own. WHAT A MESS 1 Does anyone ever sweep it out ? Temperatures in the 80's, bridge full of "road apples" We all nearly lost our lunch. Even the trail leading up to it was a mess. I've shared the Holmes County Trail with horse many times. Never this kind of mess. People. 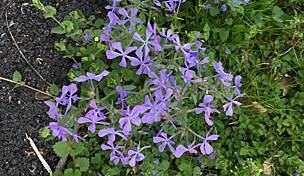 Talk to your neighbor county and get some tip on trail maintenance. Just rode from Mt Vernon to the eastern "end" of the Holmes County trail, round trip about 52 miles. Kokosing-Mohican-Holmes County trails are one of my favorite trial rides in Ohio. Lots of shade most of the way, and the Bridge of Dreams is very nice. I parked at this Trailhead yesterday to bike the new Southern Section of the Holmes County Trail. 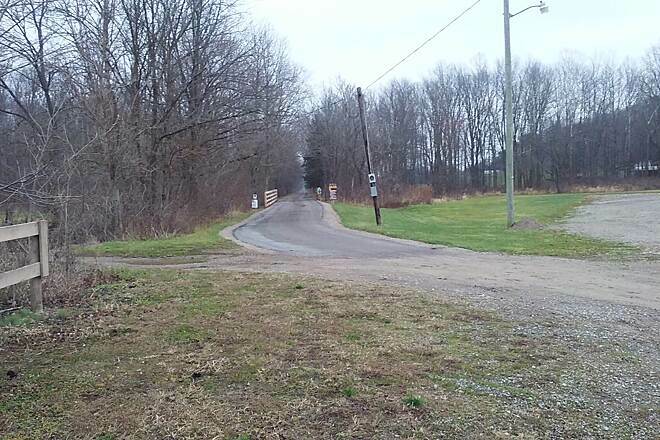 I was happy to see that the driveway from Hunter Road to the parking lot has been improved within the last month. The big crevice down the hill of the driveway has been fixed. Also heading towards the Holmes County Trail there used to be two 5' sections that was not paved. As of yesterday (8/26/2017) one of those sections had been filled in with gravel. The second section is still mud. Hopefully they're going to pave those two sections. I couldn't understand why they weren't done when the rest was paved originally. Biked more than 10 miles of this trail. Started in Danville, parked by a church. A few rolling hills, nothing strenuous. Lots of shade, Paved and a few streets to cross but not busy. The Bridge of Dreams is very nice!! 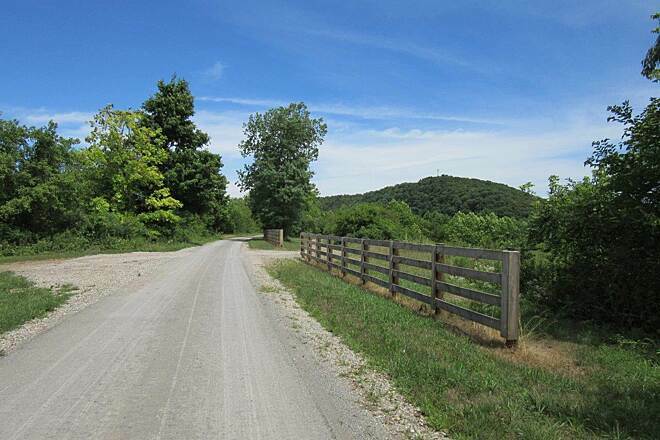 Trail is shared by horseback riders and Amish buggies. Careful, horses do leave "presents" along the way! We rode this trail from Danville to the end where it connects to under development start of Holmes County Trail. 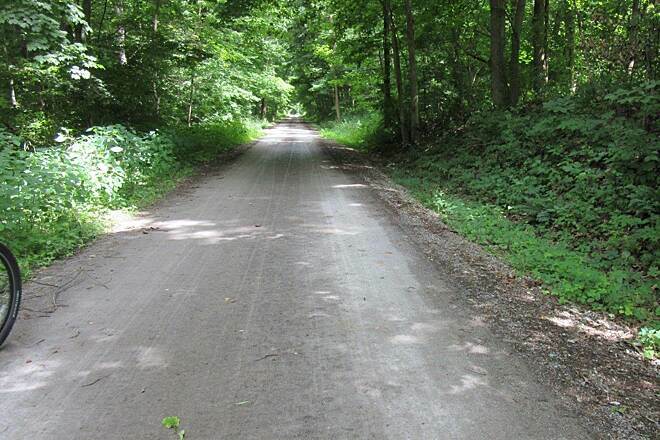 This is a nice smooth trail with some pleasant hills and beautiful nature surroundings. Watch for frequent horse droppings. We actually parked at the Danville park by the football stadium and took a quiet village street 3 blocks to trail head. We had planned on return to Danville to pick up Kokosing trail, as trailhead is approximately 3 blocks south of park, and ride to Mount Vernon but rain rolled in so we called it a day. A very nice experience and Danville is a safe and friendly place. The Bridge of Dreams is as impressive as one would imagine. We picked up this trail from the nearby Kokosing River Trail in Danville. Kokosing Tr. ends Danville, go a few blocks through the village and pick up this trail. Nearby services in Danville include a sandwich shop, dollar store, small supermarket and possibly a pizza shop. Not sure on the trail surface material. 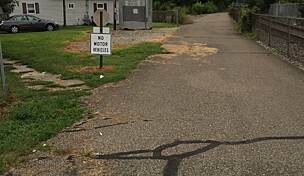 Don't think it's asphalt so it wouldn't be suitable for rollerblading. Besides, the trail has some horse do do on it. Trail surface could possibly be tarred and chipped. But in good usable condition. 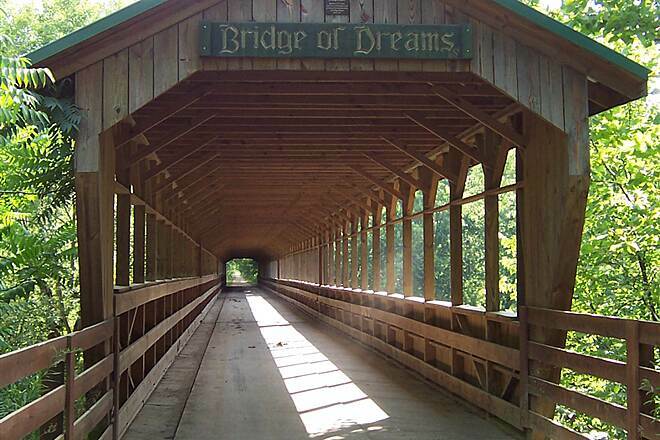 Highlight of the trail is the Bridge of Dreams, 370 foot covered bridge over the Mohican River in Brinkhaven. 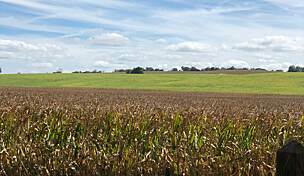 Trail has shaded areas through the woods and open areas through farmlands. This trail is shared by Amish buggies and /or horses, they are supposed to stay to one side though it didn't appear that way. Trail ends underneath Millersburg road and connects with the un-developed section of the Holmes Country trail so you can't go much farther than that. Ample parking at the trailhead in Danville. 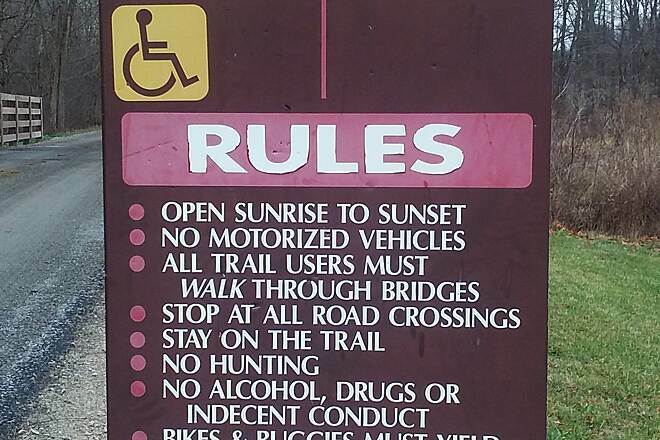 This is a great trail to ride on if you come off the Kokosing River Trail. Started at trail head in Brinkhaven. There is adequate signage to get you off Rt. 62 to trail head. It is a dirt rd. that drops down to alongside the river then under the bridge. 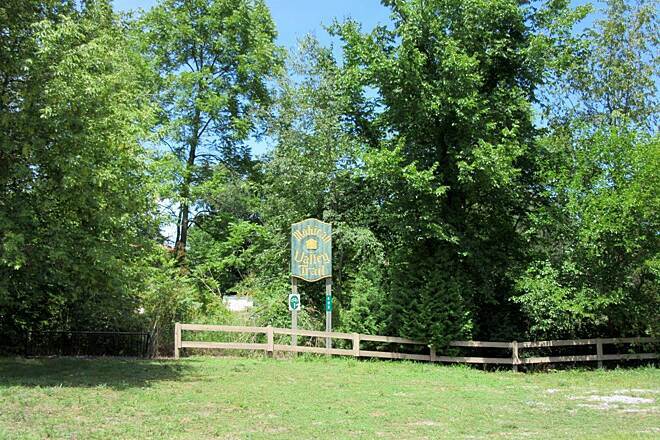 IT IS NOT MARKED but take a left at the fork immediately after crossing under the Bridge of Dreams to get to parking. Some say trail is chip and seal but I'm going to advocate it's slurry paving which is much smoother that chip and seal. Don't know how recently this was done but there is for now a layer of fine limestone dust on the top. Would strongly advise against road bike if trail were wet. I did it with a road bike tire yesterday probably going 8-10 mi an hour. It appears that this is used by the Amish as well (beware of Amish exhaust emissions) so staying in the line where the horses trod will offer less limestone dust and firmer grip. 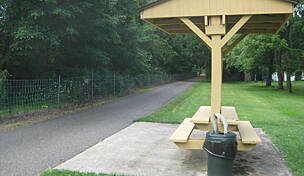 A little over 19 mi total to Mt Vernon one way using this trail connecting to Kokosing trail in Danville. Very nice! 1 - The trail is nice and wide, but the shoulders are 2-3" deep loose rock (the chips). They can really grab your wheel, especially when making room for buggies. 2 - "Road apples." Horses leave a steady line of droppings and can get pretty much unavoidable at times. 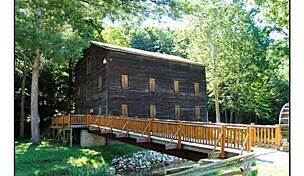 If you're a Kokosing Gap rider, give the trail a try, I think you'll like the scenery and the covered bridge. 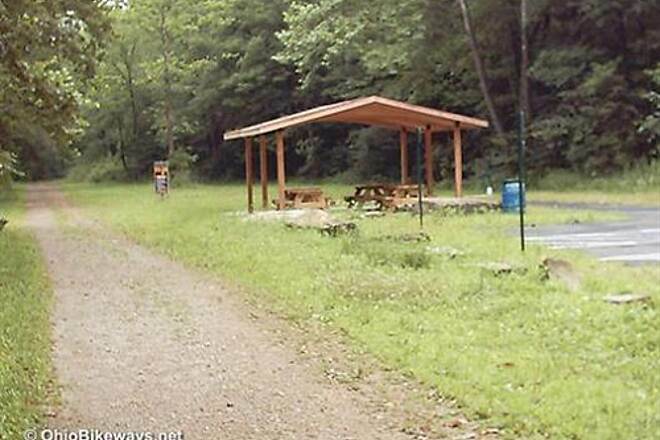 If you start at the Danville rest area at the end of the Kokosing Gap trail, riding to the covered bridge and back is less than 10 miles. 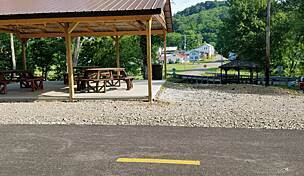 As of late September, the Mohican Valley Trail is paved. It's a night-and-day difference. Without having to stare constantly at the ground, I was free to look around, at the overarching canopy of trees, for the first time. Quite a beautiful ride. 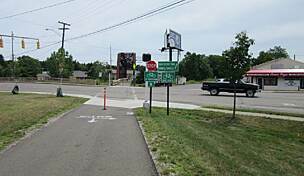 I parked in Glenmont, the trails northern terminus, and rode the trail on bike. Not a MTB, a single speed road bike. Quite a workout with most of the trail resembling a not-so-dry creekbed. I'd recommend parking in Danville and riding to the Bridge of Dreams but not much farther. 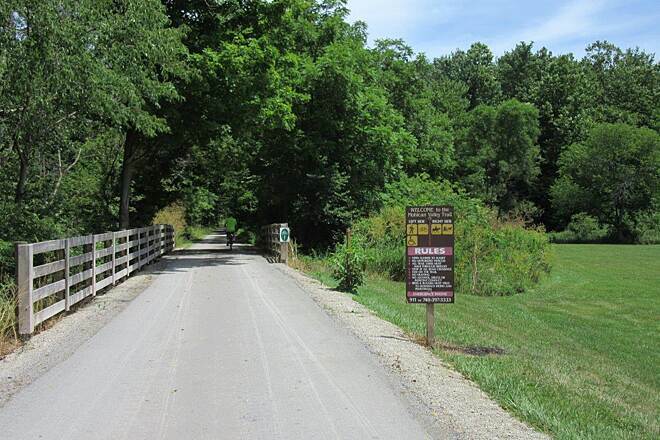 Kokosing Gap Trail also terminates in Danville for a more pleasant ride. If you're up to the challenge, however, MVT offers some nice views and a quiet outdoor experience. 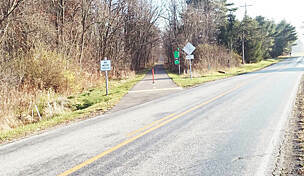 The Mohican Valley Trail has undergone improvements in 2013. 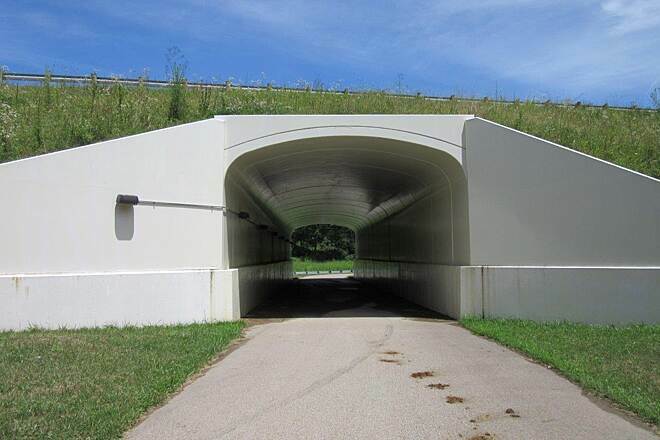 It is paved near the Bridge of Dreams East to the county line where there is a new tunnel under state route 62. 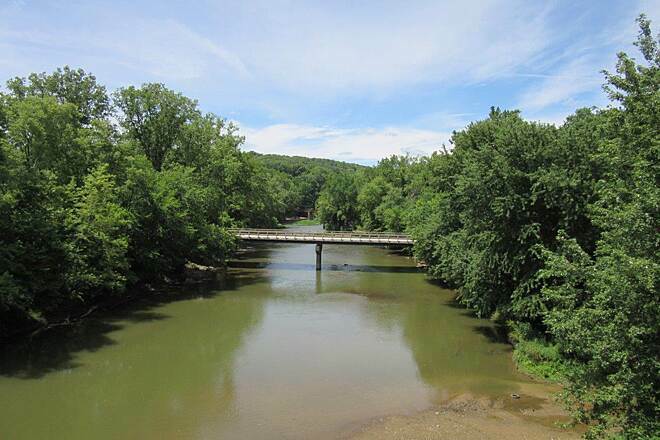 This connects the Mohican Valley and Holmes County trails, leading on to Glenmont. Not all paved yet but will be in the future. As an equestrian, I like the way it currently is, but will survive the changes. Much of the trail is very remote and not a lot of traffic, just quiet hills on either side and great country scenery. Amish buggy's share this trail. 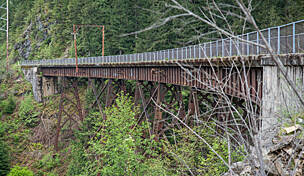 Beautiful Bridge on a Horrible Trail! First and foremost, the Bridge was great. Beautiful work. However, that trail is ridiculous. I almost wrecked on multiple occasions due to ruts in the mud/dirt. You can tell people bring their ATV's and dirt bikes on them all the time due to the ruts in the trail. Also ran into some pretty good sized rocks where if you were to hit them you would wreck for sure. Beer cans and bottles were littered all over the trail after you cross County Rd. 88. This could be such a beautiful trail. Too bad. Bridge was a dream - but not the trail! 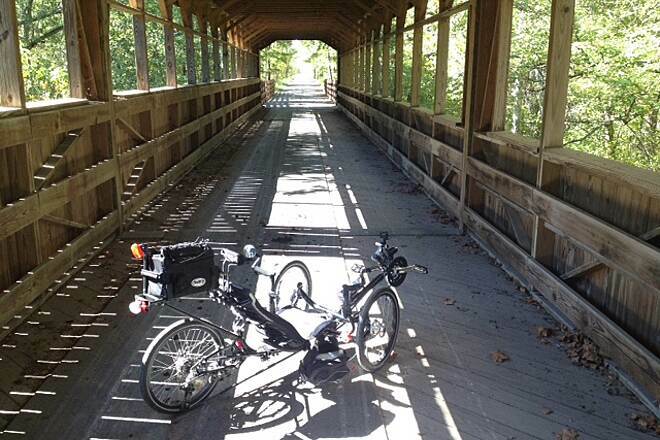 We rode the Mohican Valley trail from Danville to Brinkhaven. Even though it was the middle of summer, the trail was filled with mud puddles and soft spots. Not a very fun ride. Bridge of Dreams was neat. Tried to go to Brinkhaven, but trail dipped down into a HUGE puddle and we saw no way around it. Shame - be a great ride if it was maintained better. "Great views of the river from the bridge. 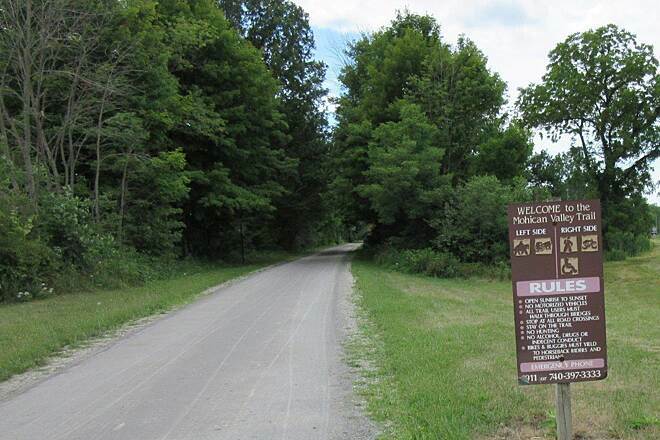 The Trailhead is on the East side of the Mohican River off a dirt road called Hunter Road (on the south side of Rte 62); after going under the covered bridge you turn left again onto another dirt road. The bike trail is ride-able sand. " 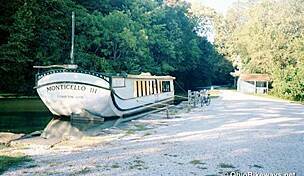 "The Mohican Valley Trail is a wonderful blessing for Knox County, Ohio. And be sure to stop Danville, Ohio. It is a beautiful place to stop and eat lunch or do some shopping. Or just sit at the park and watch the Amish buggies go by. Our town is a charming little comunity that I am proud to call home. Then ride east to see the Bridge of Dreams is spectacular. It's the longest covered bridge in Ohio and the second longest in the nation! "I really enjoyed going through the ""Bridge of Dreams"". 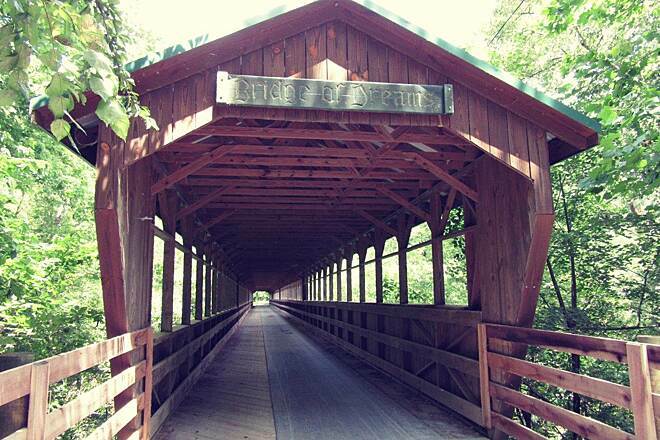 Very beautiful covered bridge. However, this trail is very rocky for the most part until you get into Danville with a VERY steep hill with loose gravel. Very rugged. I wouldn't suggest using a tandem or road bike. I used a hybrid and had a heck of a time going through the beginning of the trail. Also, I missed a detour, thinking the (detour) path was someone's driveway. They need more signs. 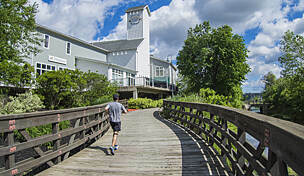 Overall, it's worth it for a tremendous view of the river from the ""Bridge of Dreams."""